Home » Category "OPD (other people’s data)"
Here are the current probabilities of winning season 11, as predicted by Intrade (as of 6:15 pm EST). I’m interested to see how these numbers evolve. 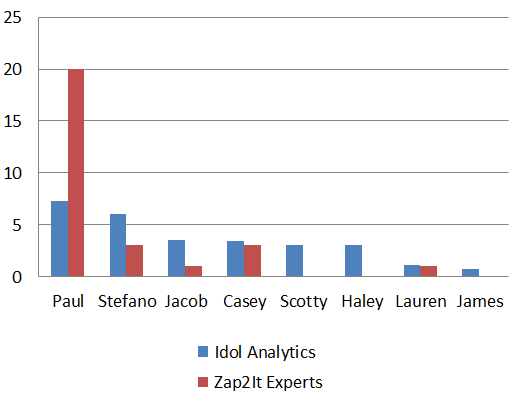 The Zap2It Idol Exit Poll has Jacob as the most picked, followed by Casey, exactly in line with the Idol Analytics model. They also assign Casey as the second most likely. Scotty, Lauren, and Haley picked up 1 vote each, with none for the (overrated) James Durbin. 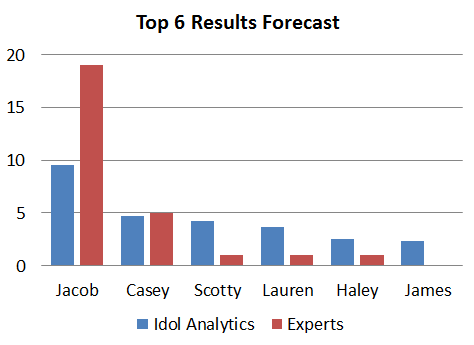 The Zap2It American Idol Exit Poll has published this week’s picks. Here they are alongside my model. Why are the experts so confident about Paul? Nobody would lay any money on Haley? And they say it’s six times more likely that Paul goes than Stefano? This is weird. If somebody were to offer me 4:1 odds on Stefano, I’d be on that in a heartbeat. Of course, the people polled only get one pick, and they don’t collaborate. Still, that’s very certain. They are also notably sure that Jacob won’t go. I just don’t see the wisdom here. Again, 4 or 5 to 1 on Jacob, I’d take that bet. 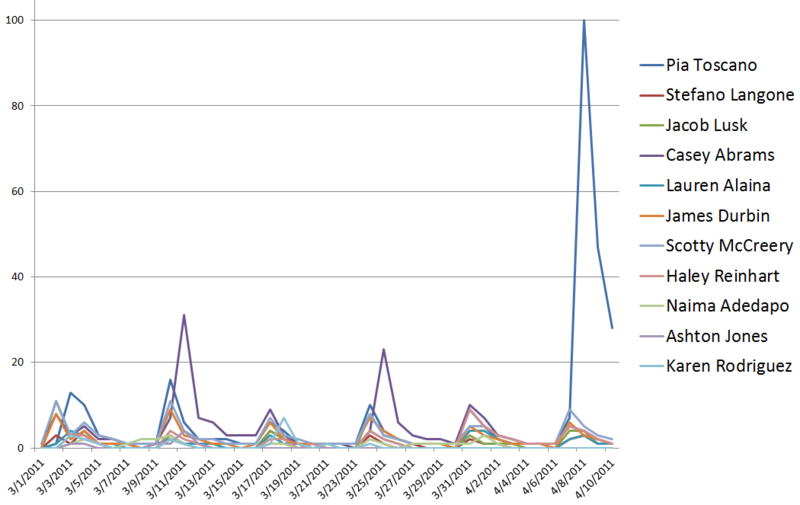 Since I’ve started building a forecast model for Idol, I’ve been terribly interested in Dialidol, a service that measures votes and busy signals during American Idol voting, and gives a raw score. Their main touted statistic is that they have never flubbed a prediction of the finale: since Season 4 (when they started), they have correctly predicted the winner of the contest every time. However, if dialidol was a perfect forecast, there would never be a need for anything else, and it’s actually quite far from a perfect forecast. I can think of lots of reasons for this, but the main problem with dialidol is, of course, that it’s got sampling problems. It only measures a small number of people using the software to register votes by calling on a land line. Cell phone calls, texts, and now internet votes, are never counted. Moreover, the fewer people watch Idol (and its ratings have been dropping), the worse that sampling gets due to simply numbers.